This is not another discourse on gender politics. Actually, “What is Man?” would be the title of a dream course I would love to teach to college freshmen. What a wonderful antidote to so much of the nonsense being shoveled to students today! Here are some of the things I would teach in this imaginary “Introduction to Man” course. 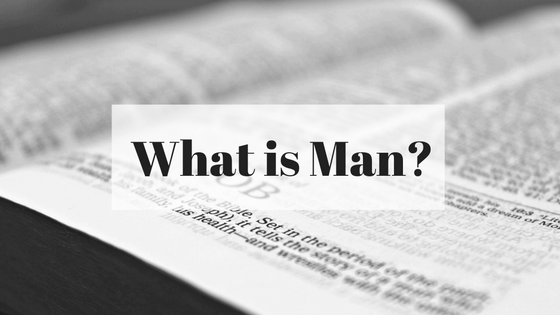 “What is man?” is an ancient question, and most of the answers offered up move to the plural tense of “man” whereas the question, I believe, is truly singular in intention. My punishment is more than I can bear. Basic human themes are embedded in these passages from the first book of the Bible. Man is an exile, a wanderer, a sufferer and he needs to account for this condition. Why does this happen? Why does life seem so tragic when each one of us seems to have been designed for relationship and community? And are not his days like the days of a hired hand? And nights of misery are apportioned to me…. This entry was posted in From The Blog and tagged Bible, christ, college course, Eric Kampmann, genesis, Getting to Know Jesus, God, god's image, human condition, Jesus, job, man, what is man, who am i on October 27, 2016 by kelly.